Another one of our regular contributors, Miranda Williams, has been crocheting up a storm, and preparing for her trek from Oregon to the East Coast as her son and boyfriend will be competing in the ATVMX nationals all this season. An adventure for sure! We talked Miranda into giving us an interview so we can introduce you to her. Check it out! Austin Rohr hails from Gig Harbor, Washington. He’s one of our newest contributors, and we thought you’d like to get to know him better. You may have already seen a few of his articles. He was responsible for the dune closure coverage we did last Fall, as well as an opinion piece on the new Quadcross Northwest schedule. Austin has also reviewed several products. He’s a busy guy, but his passion for the sport is always what’s shining the brightest. It’s obvious in his subject choices, and spend a few minutes talking with him and you’ll understand that ATVs is a subject he’s quite passionate about. Get to know the person behind the writing. 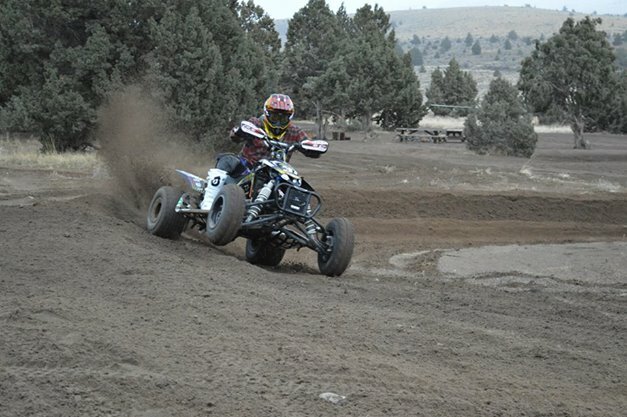 How did you get starting with ATVs, and what led you into the racing community? I got my first ATV for Christmas in 2006. It was a little Polaris Predator 90. At the time my friends had dirt bikes, but I had seen ATV freestyle at Monster Jam and was hooked. I got into racing by watching Huevos movies and YouTube videos. After riding a track for the first time in 2010 I was hooked. What appeals about racing appeals to you? I enjoy a lot about racing. I think my favorite part would be the challenge. I grew up riding trails, so motocross doesn’t necessarily come natural. It’s fun to ride something that pushes your limits. Beyond that, racing provides me with great opportunities and learning experiences, and I’ve met so many great people in this community. There’s nothing else like it. Tell us a little bit about yourself, what you enjoy besides ATVs, etc. Well between ATV’s and school there’s not a lot of time for much else, but I enjoy all sorts of things. Trucks and cars, anything with a motor really. I also like being outside, doing any kind of activity. Honestly I just like to mix it up and do new things when I’m not riding. I’m all about new experiences with good friends and family. What kind of content do you hope to provide readers of Pit Traffic? For me I just want to provide quality content that is informative and entertaining. There’s a lot of really good media for dirt bikes, but not so much for quads. I don’t want to copy them, but create content that is equally exciting.